I love Mexican food. Give me burritos, tamales, frijoles y arroz, anything spicy. I even love Mexican candy- generally considered by most people I’ve talked to to be…odd. I grew up eating Mexican food for every major holiday and what can I say? Chipotle peppers and cilantro just have a way of cropping up in my cooking. The thing I don’t love about Mexican cooking is it’s tendency to be heavy. Tonight I made burritos filled with spicy refried pinto beans, queso fresco (and cheddar for Andrew), greek yogurt, and salsa. 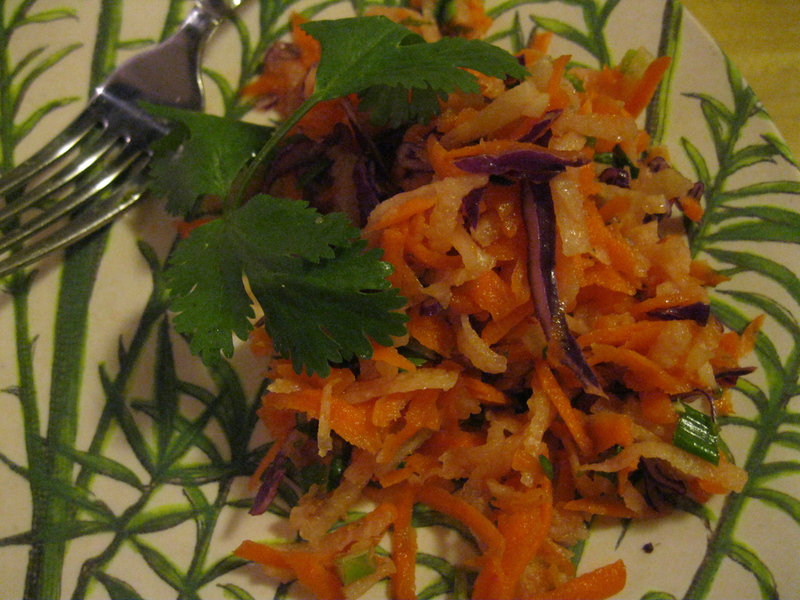 I like multiple components on my plate because I like a variety of flavors and textures, so I threw together a little slaw of jicama, carrot, and red cabbage in a lively, limey dressing to accompany them. Combine veggies and herbs in a medium bowl and toss to mix. In separate bowl, whisk dressing ingredients together and pour over veggies, tossing to coat evenly. Serves 2-4 depending on how big your burritos are.